"I thought I knew almost everything about the history of fashion until I met Kerry Taylor. The inside-out knowledge she has of garments will inspire both students and designers to look at fashion with fresh eyes." 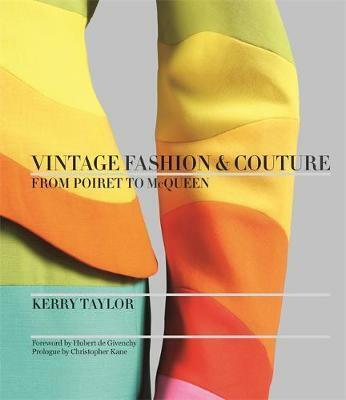 - Sarah Mower, US Vogue "This beautiful book by Kerry Taylor - the go-to woman for vintage and antique couture - is a treat for collectors and fashion lovers alike." - The Wall Street Journal "Whatever my question about vintage, Kerry Taylor has the answer. Her expertise, knowledge and historical anecdotes have raised the level of interest in this subject hugely." -Lisa Armstrong, Daily Telegraph Named one of Glamour Magazine's "Must-Read Style Books"! Profiled by Vogue and The New York Times and courted by style icons with wardrobes to sell and top designers in search of inspiration, Kerry Taylor is one of the world's leading experts on vintage fashion and couture. In this lavishly illustrated book, Kerry tells the story of a century of fashion through the work of its key design talents and the memorable women who have worn their creations. All the fashion stars are here from Poiret to McQueen via Lanvin, Chanel, Schiaparelli, Madame Gres, Dior, Balenciaga, Mary Quant, Ossie Clark, Vivienne Westwood, Alaia, and Margiela. For each designer Kerry explores their career through a dazzling range of clothes and accessories, explaining what makes each item so desirable to the collector or wearer of vintage fashion. Each chapter includes at least one 'style icon' whose relationship with fashion has had a lasting impact, including Baba D'Erlanger, Lauren Bacall, Grace Kelly, Catherine Deneuve, Paloma Picasso and Kate Moss. Illustrated with a mix of gorgeous fashion photography plus images from Kerry's own astonishing archive, this book is set to become an invaluable guide for collectors of vintage (whatever their budget) and all those who love fashion. Contents includes...Foreword by Hubert de Givenchy Prologue by Christopher Kane 1900s Paul Poiret Lucile Mariano Fortuny 1920s Jean Patou Jeanne Lavin Chanel in the Twenties 1930s Elsa Schiaparelli Style Icon Wallis Simpson Madeleine Vionnet - The Architect of Couture 1940s The effects of War on Fashion in Europe American Fashion in the Forties Christian Dior - The Saviour of French Haute Couture 1950s Pierre Balmain Cristobal Balenciaga - The Master Style Icon Grace Kelly 1960s Mary Quant Hubert de Givenchy Style Icon Audrey Hepburn 1970s Yves Saint Laurent in the Seventies Zandra Rhodes Vivienne Westwood and Malcolm McLaren 1980s Italian Masters Azzedine Alaia John Galliano 1990s The New Romantics Thierry Mugler Style Icon Kate Moss 2000s Later McQueen Style Icon Daphne Guinness Collecting Vintage Taking Care of your Collection . Kerry Taylor joined Sotheby's in 1979, and went on to become one of the youngest auctioneers in their history at the age of 21. After creating and managing the Collector's Department at Sotheby's Chester, she moved to Sotheby's New Bond Street where she re-established the Costume and Textile sales. Kerry later became Director in charge of all Collectors areas, special theme sales and celebrity sales. Kerry left in 2003 to set up her own auction business, Kerry Taylor Auctions, specializing in the fields she loves - costume and textiles. She also continues to act as Textile Consultant to Sotheby's, advising their international network of offices and regularly assists major museums with valuations, applications for funding and sits on the UK Government's Export Review board. Kerry regularly contributes to television programmes, and is frequently consulted by the press for her expert knowledge of vintage fashion. In 2007 the Guardian voted her one of their 'women of the year'. Kerry has been profiled in British Vogue and the New York Times.